It's been two years since Nest updated its Learning Thermostat, but temperature control systems aren't the easiest thing to keep "fresh" or innovative. So instead it's announcing a cheaper, but similar version called the Thermostat E.
The Thermostat E comes in at $169, a fair chunk of change cheaper than the $249 Learning model, but the good news is that it won't be skimping on many of the features. You'll still be able to control it remotely with your phone, it'll turn off when it detects nobody's home, and it will work with everything that supports Nest integration. So why is it cheaper? For one thing, it has a lower resolution display than the Learning Thermostat, but with a polarized cover that gives it a frosted display - Nest calls it the "watercolor" look. The upside is that it will probably do a better job of blending in with the walls, but you won't get the Learning's Farsight feature, which displays information like weather and time. There's also a new pre-programmed schedule that users can opt for out of the box. Maxime Veron, Nest's director of product marketing, told us this is meant to simplify the experience, but if users still want to use the auto-adapt feature they can. The E has all the same self-teaching abilities of the Learning - which means Nest can make the same energy-saving claims. Nest currently estimates users can save between $131 and $145 a year, which for all you maths fans means the E should theoretically pay for itself in under two years. Veron also told us that the Learning is still compatible with 95% of US homes while the E matches 85% (six connectors inside instead of 10). However according to Veron the extra 10% are really higher end homes. Like the Learning model, the E is also Energy-Star certified. 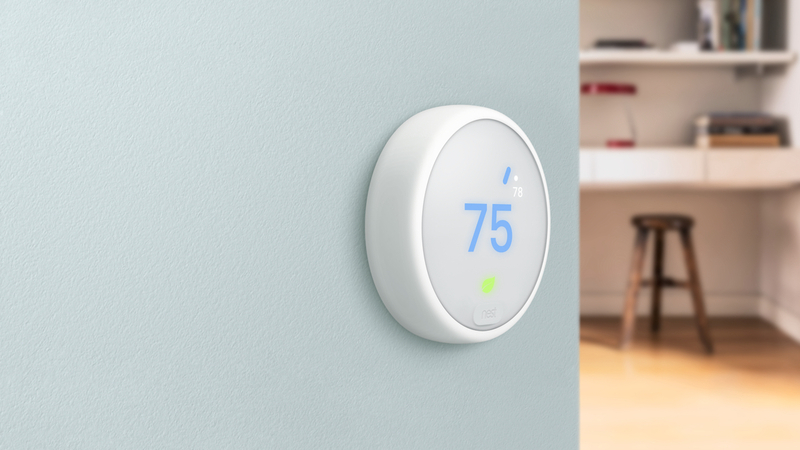 Nest will continue to sell the third-generation Learning Thermostat alongside the E, which is available to order in the US starting today. It'll ship from 1 September and be available in stores 10 September.